My mom is big on interior design, and her most recent project is redoing the tile on her kitchen wall. It wasn’t old-fashioned or broken, but she likes everything to be up-to-date and looking its best. In the same way, for fiberglass pools, tile is a matter of taste, not necessity. Here at River Pools, it’s important to us that you get the pool you want. Some customers love tile, and we’re happy to put it on. Others choose to save the money toward other features and accessories. There’s no wrong option! While you can add tile after installation, it’s generally more difficult. 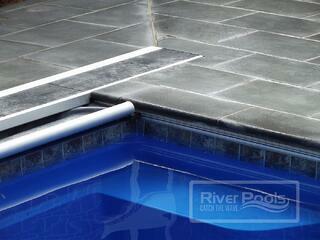 We would recommend that you choose at the beginning whether or not you want tile on your pool. Inlaid tile is usually underwater. It’s also recessed into the fiberglass pool mold so that it’s flush with the pool surface. Sometimes you can tile the surface of the steps, seats, floor, or walls. River Pools used to do these a lot. However, we don’t do them as much anymore because the tiles can come out. This requires expensive repair or replacement, including a professional draining the pool. It can be almost $2,000 on top of the initial cost. And you already know that 5–10 years later, the tile will all need to be replaced anyway because it chips, cracks, and lose its shine. Count up that cost. Yikes. In addition, tile on steps or seats is often in triangle shapes on top of the gelcoat surface. They leave hairline cracks on the gelcoat when you remove them because it weakens the gelcoat around the tile edges. 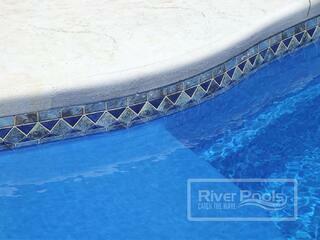 Unlike inlaid tile, waterline tile is adhered to the surface of the pool. It’s usually just a 6-inch strip of tile running along the waterline. Waterline tile is above the pool and therefore easier to repair. The pool doesn’t have to be drained all the way down for repairs. Glass tile is huge right now. Mosaic tile is also big right now—different pieces of tile brought together to form some kind of design. Stone tile provides a natural, earthy tone, which may match your goal aesthetic. Remember that your tile shouldn’t be larger than 2 inches wide. Anything larger than this runs the risk of not fitting your pool. What are the benefits of pool tile? Concrete pools require waterline tile because the plaster stains easily. Tile is the longest-lasting interior finish for a concrete pool, and it’s easier to clean than exposed aggregate. Fiberglass pools don’t need the tile, but it does add flair. Porcelain/ceramic tile can be done as a DIY project if you’re very careful, although it may not be worth the headache. Glass tile is nonporous and especially durable. It’s fire-, heat-, and UV-resistant, and it’s frost-proof. It catches the sun and looks shiny. The cost depends on your location, the tile material, your installer, and the size of the area you’re tiling. On an average pool, tile will cost about $3000. Standard tile ranges about $2,100 to $2,800. Special-order tile can cost $400–$800 more. Glass tile is more expensive. It usually ends up costing about $600 more for a pool. But it’s pretty. Very, very pretty. Only you know your priorities. How long does pool tile last? Waterline tile should last 5–10 years if you maintain your water chemistry and maintain the pool properly. Glass tile is more durable and will last even longer. 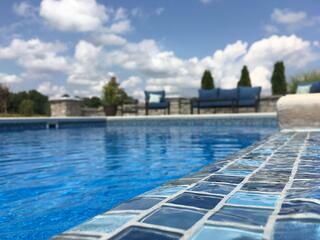 Tile lasts a little longer on fiberglass pools than on concrete pools because tile will move with the pool. 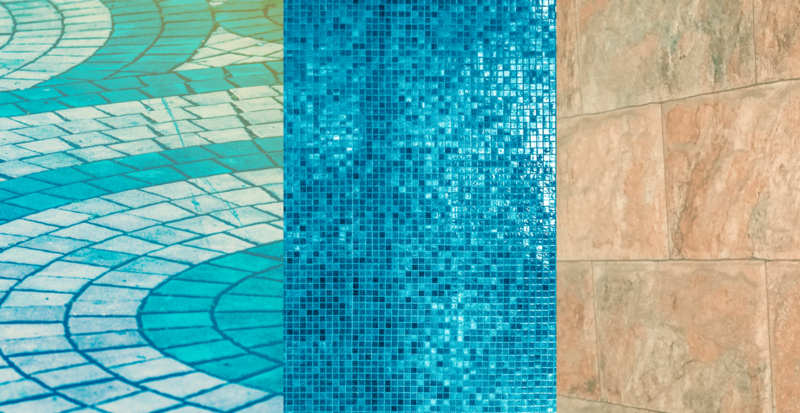 National Pool Tile Group has many tile options. 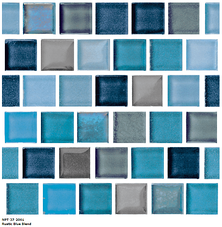 Jules Rustic Blend is probably the most popular waterline tile in the country right now. Both concrete and fiberglass pools can include tile. 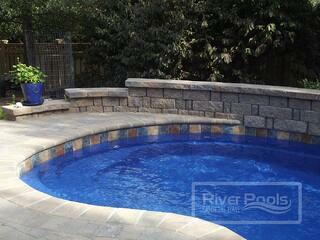 (Vinyl liner pools can't, although some liner options look like tile.) To be sure you’re getting the best pool for your needs, be sure to compare all three pool types. You may find that the advantages of a fiberglass pool fit you better! Concrete pools generally cost $50,000–$100,000. By comparison, fiberglass pools cost $45,000–$85,000 upfront but have the lowest lifetime expenses of all three, which saves you money in the long run. While the shapes and sizes are less customized, most people can find a model that fits their needs. They’re super durable and low-maintenance—not to mention pretty! At River Pools we offer fiberglass pools in Virginia and Maryland (and in other areas of the country through our dealers). Read through our ebook about the three pool types, and get in touch with us to see if fiberglass might be the right choice for you. We look forward to helping you!